One pin can change your business! I can’t wait to share this powerful Pinterest marketing story with you today! I am so excited to introduce you to my guest and fellow Pinterest marketer, Cara Chace. We met up for lunch recently and her story was so powerful that I knew I had to share it with all of you. The great part about this story is that it’s not a get rich quick type of story. You can put her strategies into action and achieve similar results, depending on the goals of your business. Like me, Cara has a Pinterest management and marketing company, but she didn’t start out there. She was recruited as a special agent for the government right out of college (the opposite of being an entrepreneur in a creative industry). She spent ten years in law enforcement, but she knew that she didn’t want to spend the rest of her life in that career. She and her husband moved from San Diego to Portland in 2011, and she had no idea what she was going to do. In an interesting turn of events, she started serving as a volunteer social media moderator for the band Megadeth. Yes. THE Megadeth. She began learning everything she could about social media marketing, and quickly became a huge asset to the band. Eventually, she became their official social media manager, juggling 17 social media account and 13 million fans! After that experience, Cara was ready to move on and accomplish other things. She went to work for a social media agency for a short amount of time, but working in that type of environment was not a good fit for her family. She started her own business, doing all the things – building websites, blogging, email marketing, and social media strategy. She spent a few of years figuring out what she really liked doing and what type of clients she enjoyed working with. About a year and a half ago, she realized that she really wanted to focus on Pinterest. She saw that, not only for herself but also for her clients, Pinterest had the biggest ROI on for their business. It was a no-brainer, especially because she personally loved using Pinterest. We live in an instant gratification kind of world. We want immediate results. We want to get rich quick. And that’s just not how Pinterest works. I’ve talked about the slow-burn of Pinterest over and over. Cara’s story is a reflection of that. 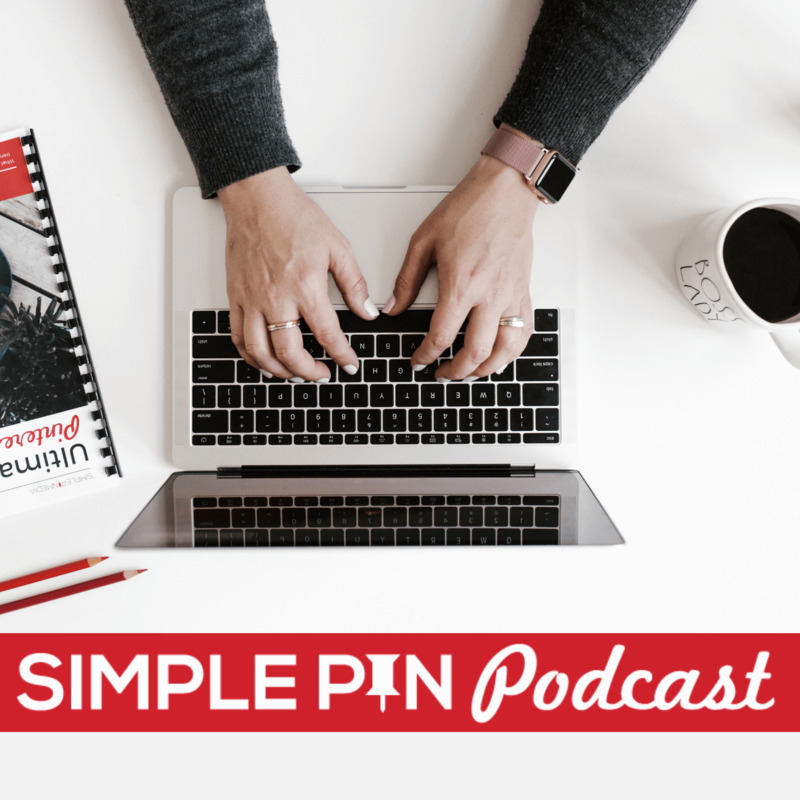 The first part of the story is Cara’s realization of how Pinterest could serve as a marketing funnel for her business. When she started her business, she knew she needed to establish herself as the expert in her niche. She created a blog post called 9 Things Your Social Media Manager Should Be Doing. Nine months into her business, she decided to look at her Google Analytics to see what posts were getting the best traffic. This is when her her “aha!” moment happened regarding the power of Pinterest. She discovered that 80% of her traffic was coming from Pinterest, and about 75% was coming from that specific post. It was mind-blowing for Cara. She knew that this was important information that she needed to leverage somehow. The blog post was more like a long article. So she decided to turned the post into a free e-book that you could get through an email opt-in. She made this change in 2015, and still gets email sign-ups for the e-book every single day. Cara doesn’t know exactly when this pin “made it big” but it wasn’t overnight. She didn’t even look at her analytics until nine months after pinning it. This result totally changed her frame of mind about Pinterest marketing. She evolved from just pinning a post and moving on, to actually putting forth significant effort on the Pinterest platform to leverage her traffic and build her business. Last summer, right before Cara was about to have baby number 2, she received an email from someone she had never met before. The woman asked her if she was interested in a speaking engagement. Cara had been doing guest training and webinars online, and a few local events, but had never spoken about Pinterest in a conference setting. The woman invited Cara to come to Bermuda last December and teach her audience of wedding professionals how to properly leverage Pinterest. Cara asked how the lady found her, and it was through an email opt-in. She said she loved Cara’s emails and all the helpful information she provided. Oh my gosh! This is how Pinterest is supposed to work. She had been building a relationship with this business owner for months without even knowing it! This is why it’s so important to have an email newsletter. We see email as a powerful way to connect to your audience! Cara didn’t go into the conference thinking about how she could get more traffic. She just wanted to provide great value to the people who were attending the conference. Because of that, she made truly authentic connections, she built her credibility, and she got more business as a result of the connections she made. A good speaker doesn’t go into a conference thinking about how they can serve themselves. They go in thinking about how they can serve the audience. Cara believes that you need to invest in your content for at least 18 months before you get the authority and platform to ask people for a sale. Learn from Cara ’s lesson and don’t just pump out content. Think about how you’re using the content and how that plays into your funnels and goals. Cara organizes her content through spreadsheets in Google Drive for all her blog index, links, and graphics. For her schedule and ideas, she uses Asana. She maps out her content by quarters, repurposing old content every month. She strongly believes that it’s not about creating new content; it’s creating new pinnable images for the content you already have. When you are trying to grow your business, you have to be patient, you have to be consistent, and you have to be checking your Google Analytics. Using those analytics tools helps you get the most information that you possibly can so that you can draw good conclusions about what’s working and what’s not working. Be as consistent as you can in your content creation, whether you’re creating new content or just new pins. Be patient while you wait on that slow burn. And keep looking at those analytics to help you know what’s working. Be open to opportunities. When you receive a random email, don’t write it off and avoid responding. It might seem like it’s not the right fit for you, but you’ll never know unless you ask questions and find out. Sift through the weeds and don’t discard every email you receive. Not everyone is out to scam you. Think clearly about your goals. What do YOU hope to accomplish and gain by using Pinterest? We tend to hear what someone else is doing and then expect that strategy to work for us. We have to follow our OWN path. You have to follow your own YOU-print and not someone else’s blueprint. Cara has experimented with every possible way that you can plan and time block. She has found that time blocking doesn’t work for her. She has a 6-month-old baby and never knows when she will have free time to devote to the biz. However, she craves structure so she “themes” her days. Monday’s are marketing days, Tuesdays are client days, etc… She always takes Saturdays as her rest day. This enables her to have just enough structure, but not such a strict schedule that she feels like she’s failing if she doesn’t get something done. Cara’s favorite thing about Pinterest is that it is the introvert’s platform! She loves that she can check out Pinterest while sitting on her couch in her sweatpants. I think we can all agree that we all need more of that in our lives. Amazing podcast Kate and Cara. Cara finally got me into Pinterest last year and I’ve never looked back (wish I’d done it earlier). You guys are definitely on point with your Pinterest Tips. And hey, thanks for the shout out of my YOUprints not blueprints method. Gotta do you! I’m dying to know what her viral post/pin was – I’d love to read that post and see the opt-in freebie. oh I’ll ask her to share!